Here is another view of it standing! I also distressed it using Tim Holtz "Gathered Twigs" ink & added twine & ribbon from Papertrey Ink! Here is my video showing you how I designed my Pencil shaped cards! Now....onto the BESTEST design team in the whole world! ;) Don't forget to click on each of their names because some of them have MORE awesome projects using these 2 stamps set on their blogs! I will have random.org help me pick the winners & I will announce all winners on Thursday, April 19th during the Stamp Release Blog Hop happening @ 12:01am PST in her video! GOOD LUCK! 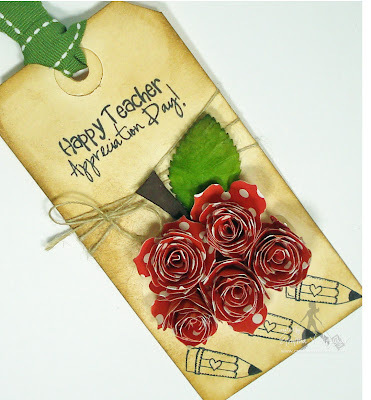 Love the projects you've made for Teacher Appreciation Week. Can't wait to see all the sneak peeks from you and your DT this week. 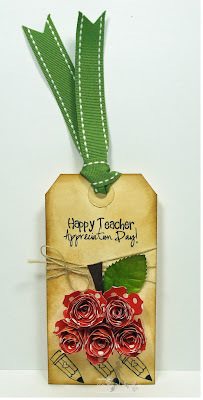 Great cards for teacher, would have never guessed it was a cricut cut...now that's a compliment! I love your pencil set. They are so cute. Thank you for sharing. Wow!! Emma these are amazing as always! So super excited about this release and can not wait to see more!! Congratulations on . . . everything! I'm so excited to see the new set! I've given you a shout-out on my fb page and I'm headed to yours now. Can't wait for the new sets! Emma, Can't wait to see what you and your design team come up with this week. Today was awesome! Love the pencil cards and so will the teacher. Love the card and tag!! Can't wait to see that die!! DT did yet again another great job!! I can not wait to see this set in its entirety! Oh just put in my order now! Your projects as well as DT are awesome!! Love all of these. They are so cute! Thanks for sharing. Really cute pencil design. Wish I had small kids to make them for. I am anxious to see this new set. the tag is really cute. Those I will do often. TFS. I love these new stamp sets. So cute. The Pencil design is so nice for the teachers. Love them!!! Can't wait to see more. Emma ~ How CUTE are your pencils! The teachers are going to LOVE them for their TU cards! Oh that tag is too AWESOME too! LOVE how you made the flowers into the shape of an apple! SOOOO excited about this release! OMG!!! I bet its gonna be another great release, I love those stamps and your projects are great. All the projects are fantastic, and I can't wait for the stamp release! These All Around stamps are going to super useful in my papercrafting projects! 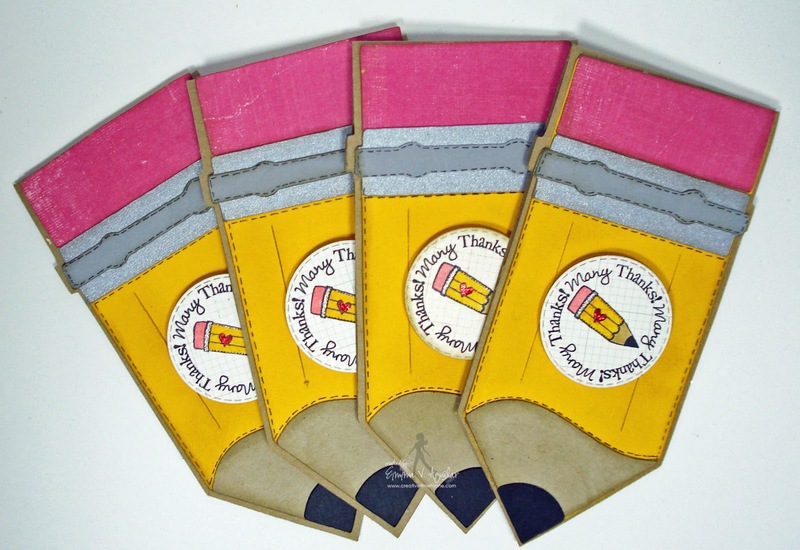 Great projects--I really like the pencil shaped cards--so cute! Loving the projects Emma, they are fantastic. I want to purchase this set already and I haven't seen everything from the release. Can't wait until friday. Wow, another great sneak peek. I love the circle stamps. I guess I better stopping eating lunch out this week so I can have some stamp buying money, LOL. TFS. these are very cute! great projects by the entire DT! awesome job !!!! I work in a school so I know how hard teachers work and how underappreciated they are so, as my sons room mom I try to show his teachers throughout the year that they are appreciated. This release is just so special for all year long. Thanks Emma! Awesome job on your pencils. What a cute releases so far. The DT did awesome too! Thanks for sharing. WOW Awesome creation by you and all the DT's. Another must have. I love your card and tag! Those pencil cards are just the cutest, Emma! The boys' teachers will adore them! And the tag is gorgeous - what an awesome gift! I am back from vacation and happy to be back in the Crafting world. Wow did I miss it. While I was gone my blog was being revamped. It is so cute just like this new release. WOW, love that card and tag Emma. OMG can't wait to see that flower die. Love all of the designers projects. I just LOVE that pencil card. I'm totally casing it! Soooo excited for the All Around Everything stamps!!!! Your pencil is sooooooooo cute!!!! Can't wait to see the flower die being used too. I am also glad to see a graduation stamp as I have to make a college graduation card for a friend of my son. These adorable stamps will have to make it to my craft room some way or another! SO cute and fun! I just have to have that adorable little tulip stamp!! Looks like this collection needs to find its' way south and into my mailbox!!! This is great and the DT did a fabulous job! Love the flip flops, the litle pencil, the monkey, the 3d flowers...OMG OMG OMG. YIKES, I'm all ready lovin' what I see. From the super cute wedding cake to the itsy bitsy bikini and the sentiments rock! Looking forward to this week of peeks from you and the design team! Happy Monday Emma - bring it on! Emma, this looks like such an exciting release! I can't wait to see the whole thing. You and your team did amazing!!!!! Emma, your stamps and dies are absolutely beautiful. I love how practical they are. great projects! I love, love, love the circle sentiments!!! I have a few circle punches and the stamsps would be perfect""your designers are fantastic - ngreat variety! Great projects-another must have stamp set! Wow!! Great projects! Love your pencil thank you cards!! This release looks AWESOME!!! The cards are amazing and I'm loving all of those stamps. Perfect little sentiments. the pencil cards are just tooo stink'in cute!! I love these sneak peaks...I feel the order already being placed. Shared on my BLOG and FB page. Love your teacher gifts! Your design team did a fabulous job! I can't wait to see what is in the new release! You always have awesome stamps! Oh what a release! Both your projects are fabulous as always! DT is incredible, love everything! Love all the projects!! The pencil look so cute! Oh my...Emma...YOU rock! I love the cards...the teachers will be more then happy to get these sets! What an awesome sneak peek!! Beautiful card Emma! I love these cards...so super cute!! this is an awesome thank you card set! I love the pencils!! can't wait to see what else is coming up this week! Great video and projects to showcase your new stamps...they are wonderful. Your Design Team is so talented and did an awesome job. I shared on facebook! Emma your pencil card set is so adorable! And I love all the projects your design team did, they are so awesome! I love all the stamps and am so super excited about them! Thanks so much for sharing and cannot wait till tomorrow to see what everyone comes up with! :) Have a wonderful day! Awesome sneaks and projects Emma! I know flower die is going to be awesome :) Thanks for sharing! What a cute pencil card! You are so creative! All the projects are so adorable, cannot wait to see this release!! These look like a lot of fun. Can't wait to see the rest. Excellent idea! I'm totally using this idea for my daughters' teachers. Thanks, Emma! Loving whatI'm seeing so far! Can't wait to see the full release. Your project is stinnking cute! Great projects Emma. Can't wait to see the rest of the releases. Love the sneaks! Just finished and posted a tag on FB! love the cards Miss Emma. the sneak peak is really nice. Wowzers! What a sneak peek! Your design team is fabulous! I love everything and want it ALL!!! I have to say, as a teacher, I really LOVE the pencils!! =) I'm excited to see the rest of the release and not just a sneak peek! I can tell it's going to put a dent in my pocketbook! Great projects!1 Love all the sneak peaks! I love your projects to start off this sneaky peek week...your pencil card and Tag are sooo ADORABLE! I LOVE your flower die...the details are BEAUTIFUL! What a clever idea to shape it into an apple. Also, CONGRATULATIONS for being selected on Jinger's DT! Always look forward to this time each month!!! Day 1 was filled with such cute stamps & super cute projects! 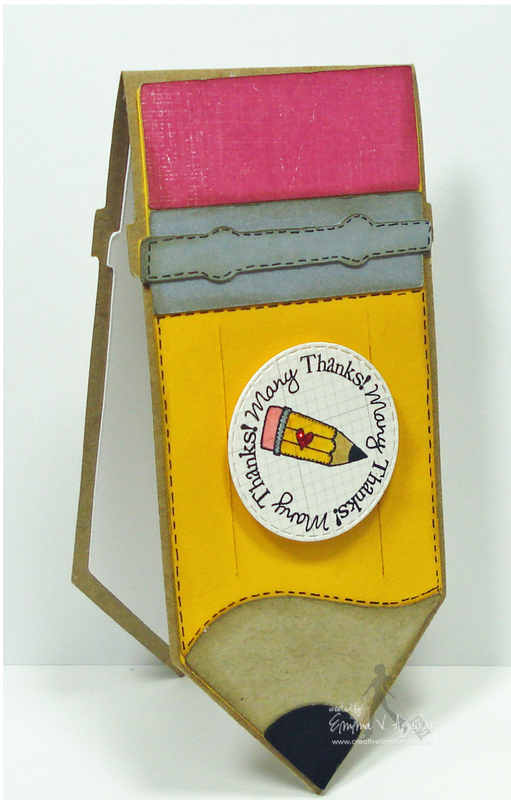 Your pencil card is so cute, was just thinking how cute it would be to make that into a little notepad! What a great project. I can't wait to see all you have in store with this release....the peeks look great. How adorable are these pencils!!!! What a great teachers gift...you are always so thoughtful!!! Love what I see and can't wait to see it all!!! Congrats also on making Jingers DT!!!! I'm so excited and thrilled for you Emma!! One of my most favorite things is how awesome your shaped cards always are!!! You are such an inspiration! I'm going to have to try these more often! Thanks for all you do Emma! This is a fabulous release. And I think these teacher cards are absolutely AWESOME!!! Just what I've been waiting for. I always look forward to your releases! You haven't even gone through all the stamps in this release and I'm already anxious to see what you're going to bring us next. Great stamps Emma! I just love what I've seen! Awesome team and you are an awesome stamp designer! I just love your pencil thank you cards, they are so cute and your tag is too cute!! Can't wait for this new release! My oh my I'm super excited!!! love all these projects. I cannot wait to get my hands on this set! I have fallen in love! Thanks so much! Wow! This new release looks like it's going to be a must-have for me! Love shaped cards, your little circle sentiment pencil is darling. I love these projects!! How fun!! These are lovely! Love the tags and all the different takes on the little circles. 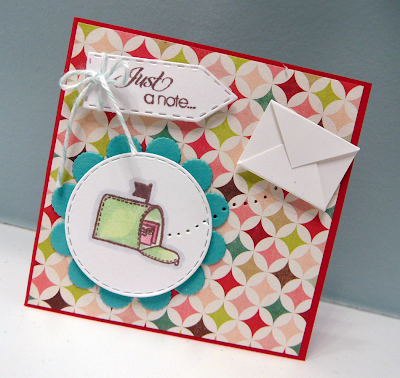 I love round sentiments and the cute little stamps for inside the circle. Great projects. You amaze me! LOVE the all the projects. Your dt is wonderful!! I love the round sentiments!! I love your "all around" series! You bet I'm gonna add to my Emma collection :) and get those stamps! So excited! Love the pencil card idea. Can't wait to see more "sneak peeks." Oh, I just love these little circle stamps...super cute! Adorable pencil card and that rose tag is to-die-for!! What a wonderful collection of projects by the design team, too. So cute! Love these circle stamps. Can't wait to see the whole set. TFS. Your sets are to be admired. Loving the pencil cards. Card sets as gifts is an excellent idea. TFS! Love the pencil cards, makes me wish I had some teachers to share these with! Love love love them! Love the all around stamps!! Your cards are so cute. What a cute card and the tag is just beautiful. The flowers are so pretty. Really looking forward to seeing the full sets. Thanks! WOW Emma!! I am in love with the felt flower dies! You rocked this release as usual! big hugs! Oh Emma, your projects are super duper cute!! I didnt even know there was a pencil in that cart LOL! and your DT, as always, FABULOUS job! Awesome projects by everyone...love your pencil card Emma!! To the person who made the blue card with the stars and the button ~ Great card. Simple and pretty. Love that pencil card for the teachers and the tag is great too. Hi inspired by your card and tried making one and turned out good. thanks u sooooo much.